The two names that are consistently dropped when it comes to male English authors who write genre novels with extreme sophistication are John le Carré and Patrick O’Brian. The latter im familiar with. i devoured the Aubrey-Maturin series in my teens though i only got ten books in. i always had one volume or another open under my desk in high school. 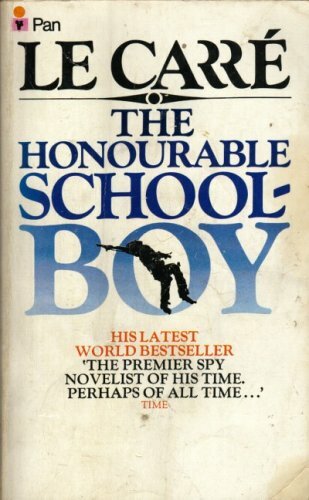 On the other hand, THE HONOURABLE SCHOOLBOY is my first le Carré, chosen bc it takes place in Hong Kong and Southeast Asia, although it’s the middle book of a trilogy about the grandfatherly head of MI6 or “the Circus,” George Smiley, and his rivalry with Karla, the head of a Soviet intelligence apparatus. i picked up a yellowed paperback copy way back in 2010 and didnt get around to it until just now. Capsule review: i liked it.